If you have a kid that likes loves dinosaurs, you should think about making a cool volcano cake as part of a dino scene for his birthday. It costs very little, it’s easy to make, & your child will remember it for a long time! Your child will want to help decorate the cake, giving advice and helping to set up the scene. You can make this many ways, but I made a bundt cake & put it on a foil covered cookie sheet. I put a plastic cup upside down in the hole of the cake, then frosted everything in a medium-colored chocolate icing. I used some red gel icing for the lava coming out of the top & flowing down the side of the volcano. You could also use red gummy worms that you flatten to look like lava streams. We placed clean (via the dishwasher) plastic dinosaurs around the bottom of the volcano with some icing under them. If you have any plastic palm trees, etc. they can be added and/or use raw broccoli florets. This was his birthday cake & he loved helping make it. The kids at the party thought it was pretty awesome too. 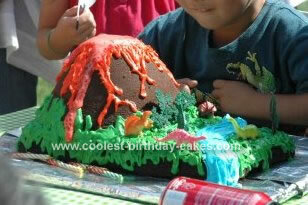 Click here for more photos of volcano cakes for plenty of ideas. You can see that it doesn’t matter too much how it looks. The important thing to your child is the experience of making it and having plenty of input on how it should look. They will be so proud! Looking for more dinosaur fun? How about carving a watermelon into a T-Rex? It’s easy to do and I guarantee it will scary enough for everyone. Click here for the tutorial. You’re welcome, Buck. It was a great party. We added some special effects of whipped cream “smoke.” We added it at the last minute so all could enjoy the sound effects of the Reddi-Whip can. Each person’s piece of cake deserved some smoke too! Cool idea and pics! Must have been a great birthday party. Will keep this in mind if I ever need to jazz up a kid’s birthday party. Thanks for sharing! You’re very welcome, Miss T! There are so many fun ways to teach kids about food. When they help make something they are more likely to want to eat it. They love raw veggies with dip! I will definitely have to keep this recipe in mind when I have kids. I think making food fun is really important to teaching kids how to eat right and eat at home. Thanks for sharing. Thanks, Harri! It’s a lot of fun & the kids love it! The kids love to help with this one! Hey, it’s fun for adults too! That’s AWESOME! As a kid I was weirdly fascinated by volcanoes (and subsequently dated a geologist who was more than a little bit fascinated by volcanoes). Best birthday cake idea ever!